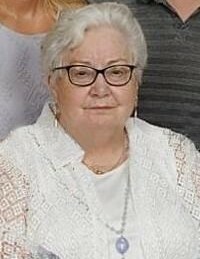 NASHUA- Gisele C. Rodrigue, 78, died peacefully Monday, March 18, 2019 at Southern New Hampshire Medical Center surrounded by her loving family. She is the beloved wife of Andre Rodrigue. Gisele was born on January 17, 1941 in Saint-Georges, Quebec, Canada and was the daughter of the late Joseph and Odile (Turcotte) Pomerleau. For many years, Gisele worked as a school teacher while living in Canada before moving to the United States. She volunteered at Southern New Hampshire Medical Center for many years. In her free time, she loved to play Bingo and travel, especially trips to Las Vegas. She was an excellent seamstress and enjoyed cooking and trying new recipes. She truly loved family dinners with her family. It gave her the chance to spend time with the people who she cared most for. In addition to her husband, Andre, she is survived by her daughter Lynn Rodrigue and her fiancé Robert Peck of Nashua; her three sisters, Colombe Veilleux, Rita Lessard and Jacqueline Drouin, all of St. Georges, Quebec,; four brothers, Herve, Denis, Jean Luc and Normand Pomerleau, all of St. Georges, Quebec; as well as her sister-in-law, Anne Pepin and her husband Claude of Repentigny, Quebec and many nieces, nephews and cousins. Gisele was predeceased by her sister Rolande Morin and her brother Marc-Andre Pomerleau. Relatives and friends are invited to Gisele’s visitation on TUESDAY, March 26th from 10 until 10:45 AM in Parish of the Resurrection Church, 449 Broad Street, Nashua. Her Funeral Mass will follow in the Church at 11 AM. Burial will take place at a later date.